I met this really cool chick at the cooking demo I did in Hoboken a couple weeks back. Like me, she’s a blogger. Unlike me, she’s a newlywed! 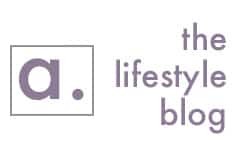 Her blog, Life a la Wife, chronicles her adventures living with her new hubby! 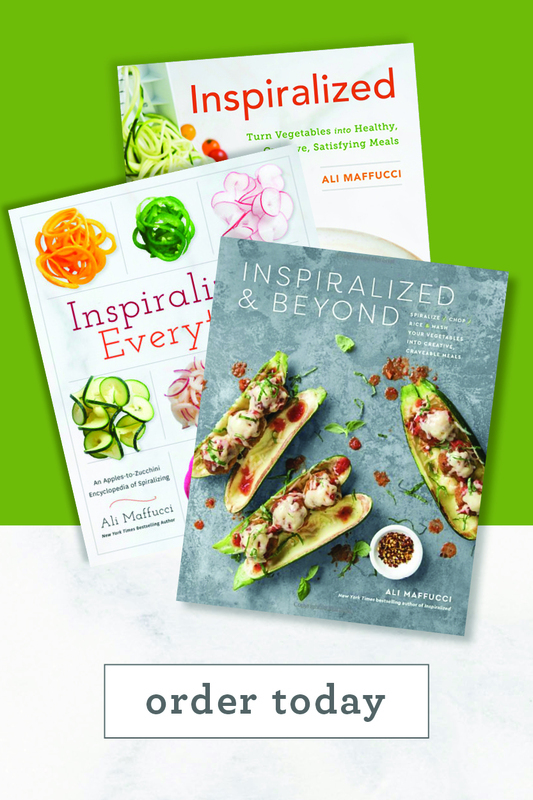 Alyssa loves to eat healthy, be active and live life to its fullest…. pretty positive vibes, right? 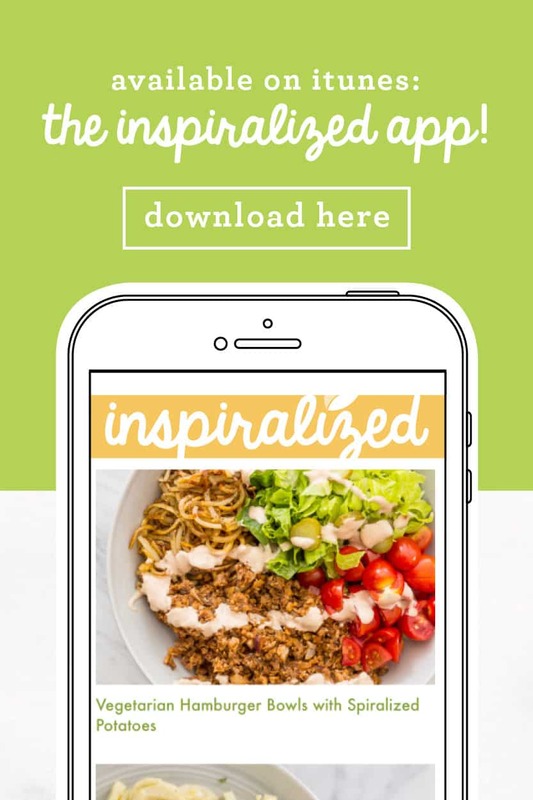 Naturally, I figured her readers would love an Inspiralized recipe. 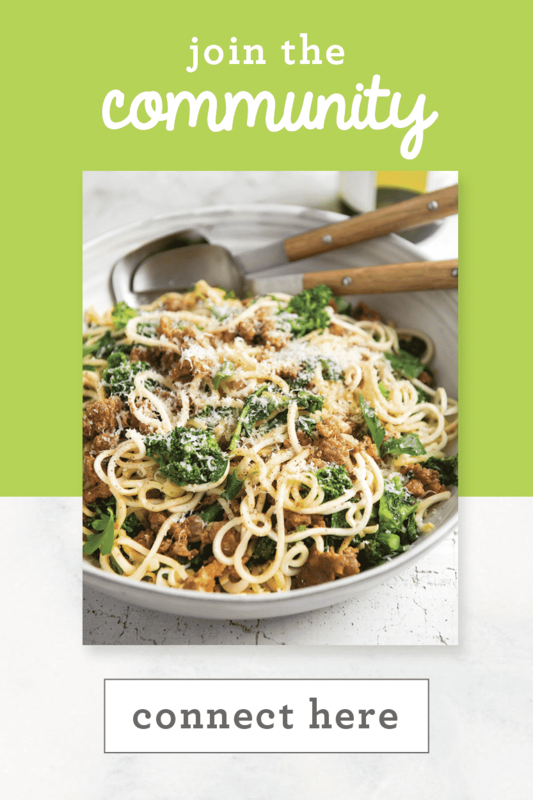 What better dish to create for Life a la Wife than a manly pasta that any husband (or boyfriend for that matter) will love? 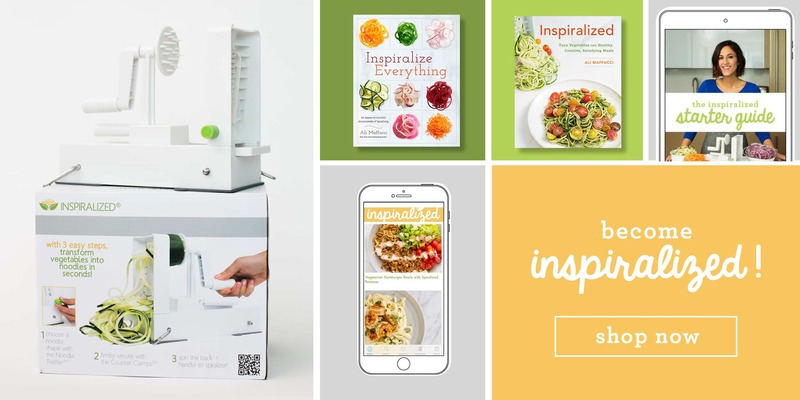 A great way to ease the “manly” man in your life into healthier pasta (Inspiralized pasta!) 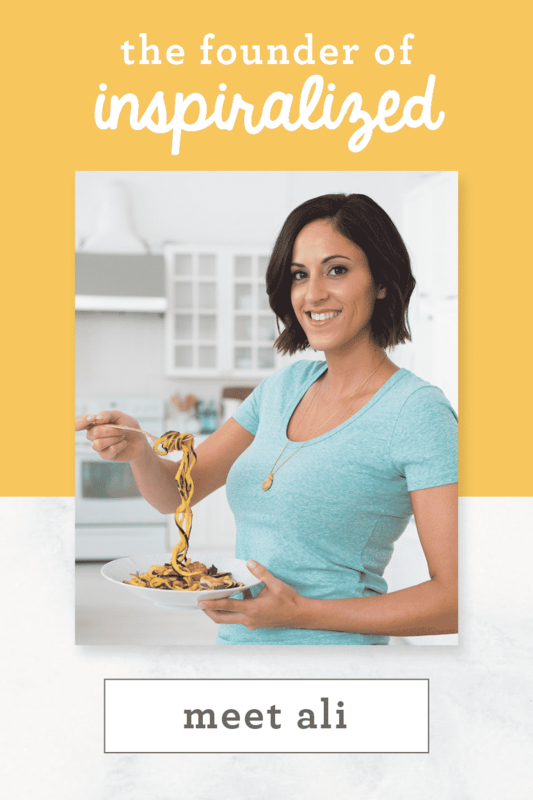 Read more about this recipe and why I decided to make it on Alyssa’s blog by clicking here. In the meantime, here it is…. 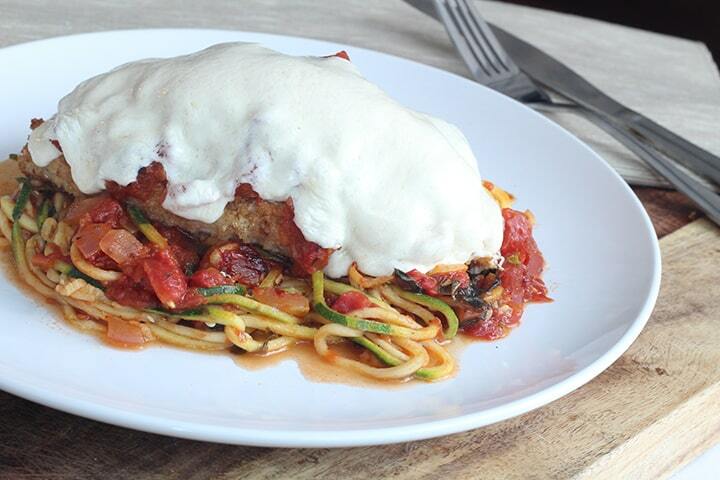 a healthy spin on Chicken Parmesan! 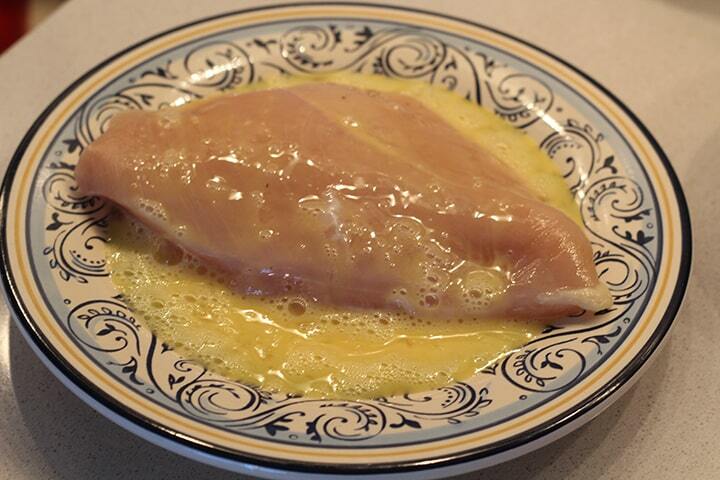 Recreate this in a skinny version for yourself by skipping the breading of the chicken. Then, when adding the mozzarella to melt, use half the amount of cheese. 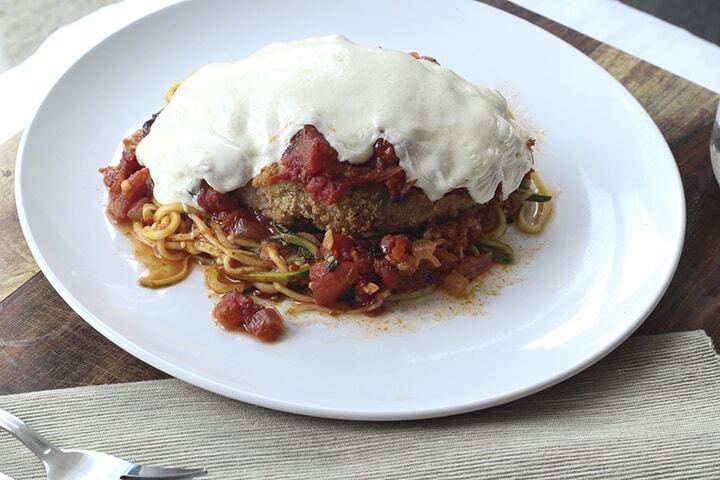 After plating, top with 1-2 tablespoons of breadcrumbs to get a bit more of that crunchy chicken parmesan feel. Almost half the calories and just as much deliciousness. 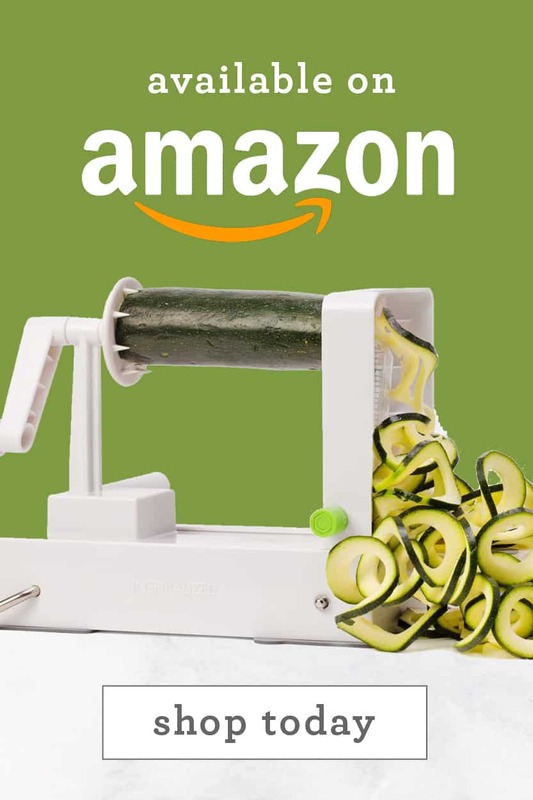 Now you can eat alongside your manly man and not feel as guilty! Preheat the oven to 405 degrees. 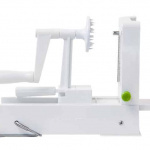 Place your piece of bread into a food processor and pulse into breadcrumbs. Pour into a bowl and season with the oregano, garlic powder and then salt and pepper to taste. Take out a baking dish or tray and pour the breadcrumbs onto the tray. Add in Parmesan cheese and mix thoroughly to combine. Set aside. Start your sauce. Place a large skillet over medium heat and pour in olive oil. Once oil heats, add in garlic. Cook for 30 seconds and then add in red pepper flakes. Cook for 10 seconds and then add in onions. Cook, stirring frequently, for about 2 minutes or until onions begin to soften and are translucent. Add in diced tomatoes, oregano and season with salt and pepper. 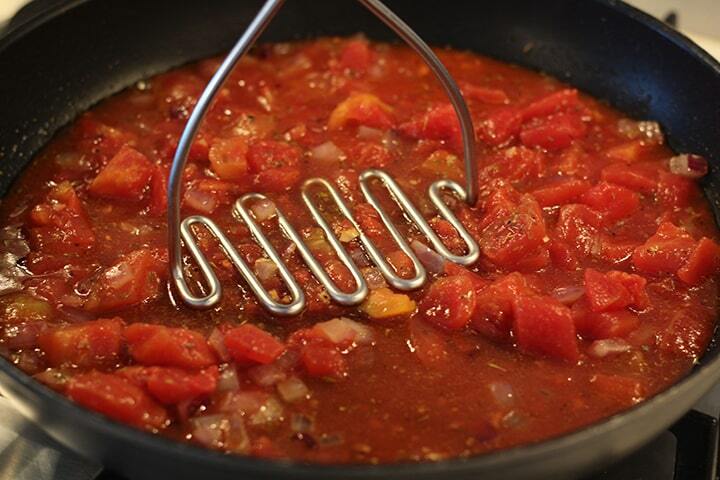 Crush tomatoes with a potato crusher, stir and lower heat. Simmer for 15 minutes. Coat a baking dish with cooking spray. 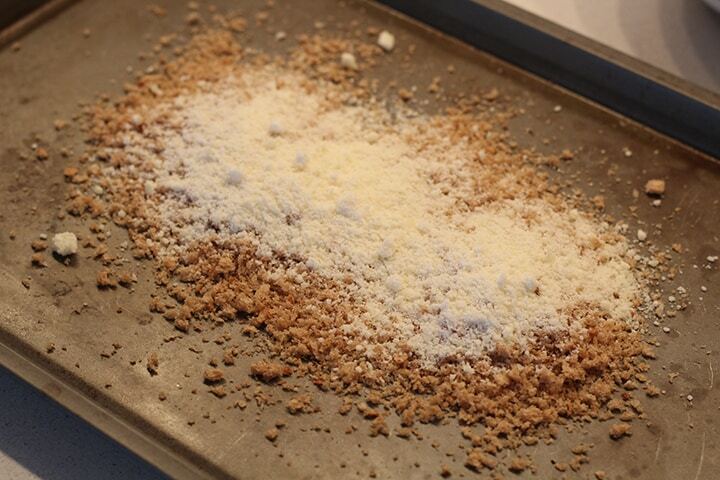 Dredge your chicken in the beaten egg then dip in the breadcrumb-Parmesan mixture. 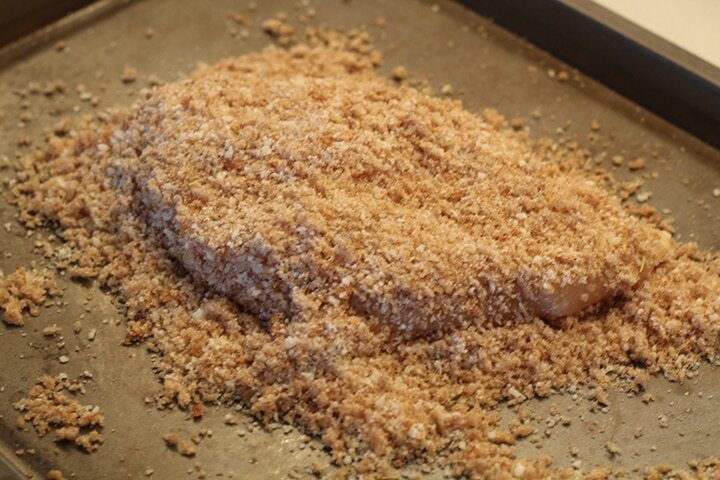 Dip on both sides and pat breadcrumbs into any crevices on the chicken breast. Place on the baking tray and put into the oven for 17-20 minutes, depending on how thick the chicken breast (thicker = longer). Continue to simmer the tomato sauce until all the juice is absorbed, adding in the basil at the end. Once done, reserve half of the sauce and keep the rest in the skillet, but turn off the heat. 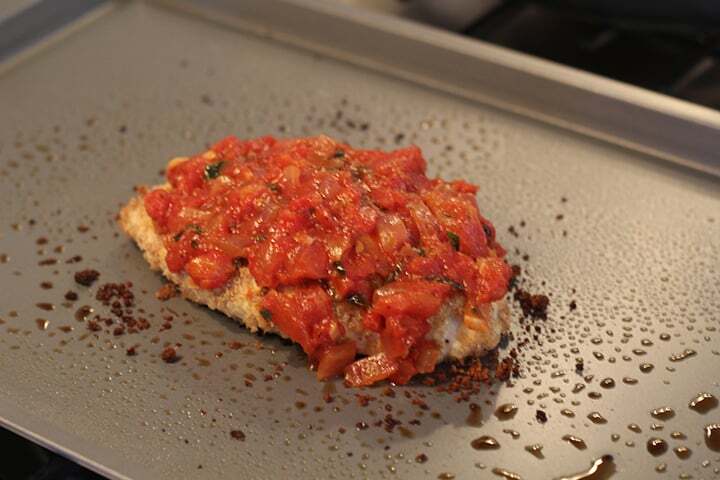 After the chicken is done, take out, pour on the half cup of tomato basil sauce, top with mozzarella slice and place back in the oven for 5 minutes or until the cheese melts and starts to lightly brown on top. 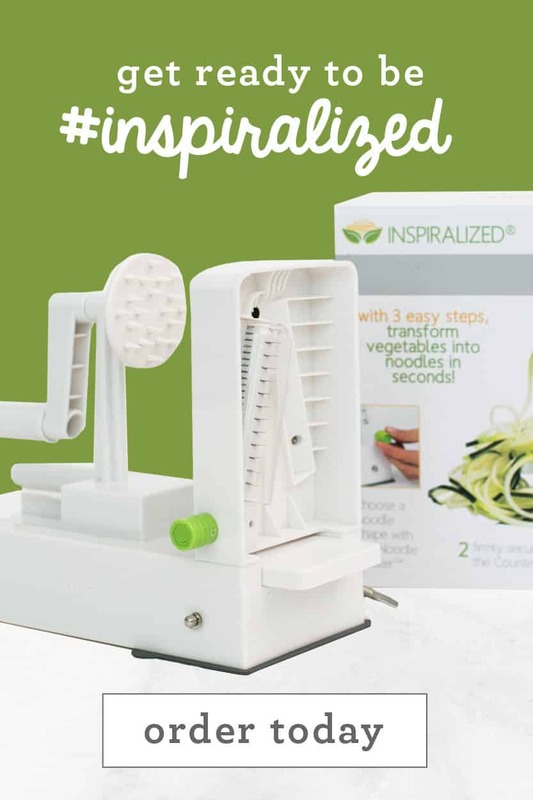 While the chicken is cooking for the last 5 minutes, turn the skillet back on, throw in the zucchini spaghetti, and toss to combine, cooking for 3 minutes or until zucchini softens and sauce is heated. 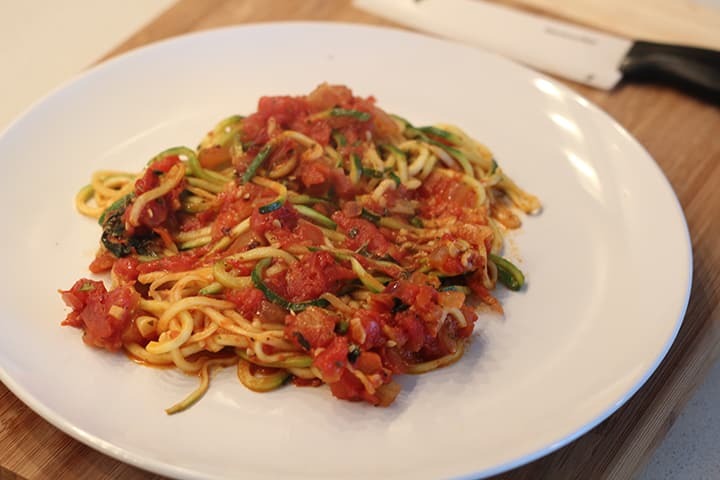 Place the zucchini pasta down on a plate and set aside. 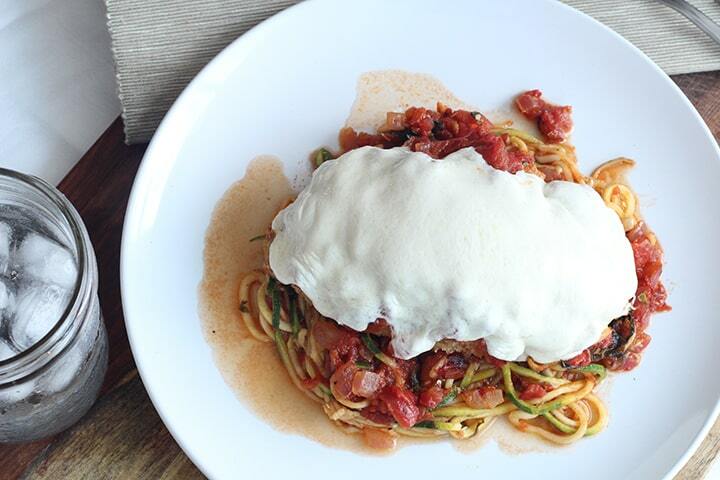 Top the pasta with the chicken parmesan and enjoy. 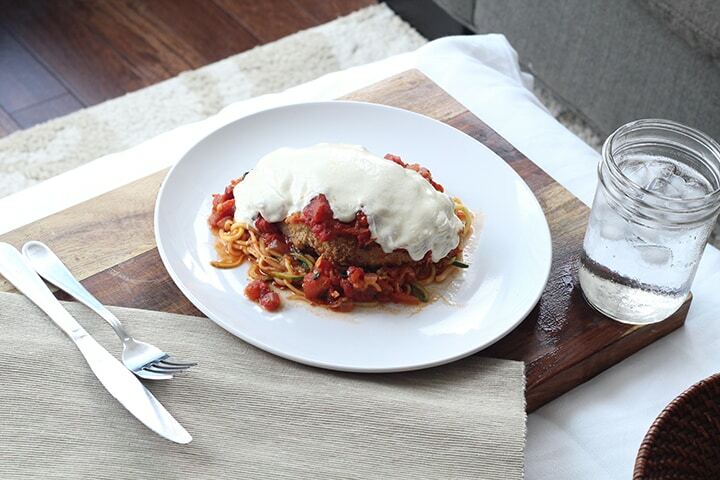 Top the pasta with the chicken parmesan and serve to your thankful and adoring man! This dish is sure to please his tastebuds. made this last night, but used Hungry Girl's recipe for coating the chicken, with Fiber One! Delicious. I loved this sauce! !